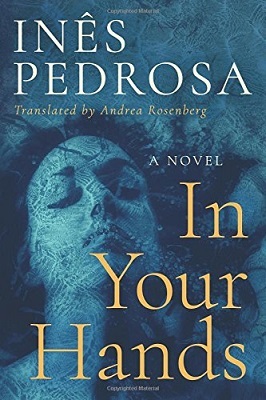 The following is from Inês Pedrosa's novel, In Your Hands. 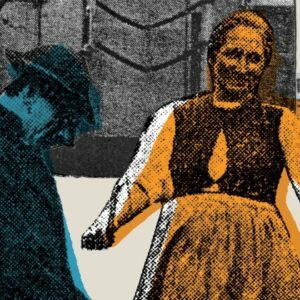 In 1930s Portugal, upper-class Jenny marries a man who also has a male lover. Together, the three raise a daughter, Camila, whose reminiscences of a long-lost love shape the future of her daughter, Natalia. Inês Pedrosa has won several awards for her journalism and literary work. She has written 18 books, and is currently a columnist for Sol, Lisbon's weekly newspaper. Every night of my life I thanked God for the gift of that ever-unchanging emotion. Many marriages collapsed, others swiftly decayed, swept up in the frenetic music of an increasingly troubled era, but ours remained pure, floating above the world’s tribulations. At the end of the reception, the three of us went up the stairs, holding hands, seized by a fit of laughter. “Aren’t you going to carry your bride over the threshold?” someone asked, and you answered, “No, she’s the one leading us by the hand.” The girls let out little shrieks of excitement, called me a lion tamer, and tossed flowers at me. I felt dazed as the petals rained down, the champagne rising to the most lucid corners of my skull, opening all the doors that connect the soul to the entrails. In the dark hallway, the sound of your voice was as clear as a mirror: “Jennifer, darling, sweet girl, you’ll sleep in Pedro’s room. Go on and see if you want to change anything more to your liking. We want you to feel at home here, my dear.” Then you chucked me under the chin, Pedro planted a kiss on my head, and the two of you went into our bedroom, the one with my grandmother’s big four-poster bed and the intricately stitched linen bedding that she’d embroidered to celebrate my entrée into the world of real love. I didn’t understand why nothing was happening the way social norms indicated things should, but that night I didn’t even feel sad. I was exhausted from smiling and dancing all day, tired of being beautiful and lively in a heavy dress better suited for royalty than for a wedding, and I thought only that you wanted to protect me, as always, or that you were prolonging the perverse pleasure of waiting a little bit longer. Again and again I twisted the wedding ring on my finger, filled its warm gold with kisses, and fell asleep, no longer afraid of that final moment of surrender that had so unsettled my dreams. I never told anyone this story. It didn’t seem to be of any interest—people are bored by happy tales, and with good reason: happiness calls up those parts of us that are most melancholy and lonely. I’ve started writing it now most of all for Camila—I am afraid that one day she’ll discover all the facts and be angry with us. There’s no such thing as facts, my dear Camila: they are game pieces we create and move around to make ourselves feel victorious, or at least secure. Everyone has his secret, every love its nontransferable code. You were born of our love, and I owe you an effort to decipher the code that is your inheritance, the light given to you, that you might transform it into your own particular vision. Above all, do not seek in love a path that is not there. At the end of the war, finding themselves surrounded by ruins, people believed they could save the world through construction. Builders grew wealthy and began to be called contractors and were universally admired. Utility became the predominant value; philosophers studied natural sciences; social anxieties were laid out on tables as had previously happened only with pie crust, live animals, and human cadavers; and private practices were set up to solve people. And love, which has no solution, disappeared. Time took its place, but time turns in the opposite direction from light, moving from white to black. That’s why it has to turn faster and faster, and so life passes by without our noticing. Love, Camila, is the only fetter there is on death—that’s what I was tempted to tell you when that bolt of lightning took Eduardo from you. The cruelty of love is precisely that: it fixes life motionless in eternity. But the lightning was exempt because it was so literal. Had it not happened during the day, nobody would have believed that a young man could disappear like that, emerging from the sea, twenty years old, riven by a bolt of lightning plunging from the sky. Light has its strategies and its chosen few. You were marked by it from birth: without that tongue of fire turning your first beloved to ashes, you might never have found that out. Don’t think I’m here to cover over the plot of your existence with gold leaf. No, my only aim is to describe the potential truth of these seventy-five years of mine. As you know, I never had to look for work or develop a skill. It’s agonizing for me sometimes to see you torn apart by money, Camila; you get furious with me, say it’s people’s subservience that you find so appalling, the ease with which they stoop to power and abandon everything they believe in, but it is money that makes people stoop like that, shiny money that garbs them in the color of time, a long mantle made of rectangular scraps of paper that they mistake for glory and eternal happiness. You swiftly respond that that’s the way it’s always been, which is probably true, but I’m part of the last generation of women who were spared the indignity of having to earn a living. I saw the Marquise of Faya placing her last chips on the green felt of the gaming table, saw her die at the croupiers’ feet and be shoved down the table by the eager feet of other losers, but I never saw two female friends competing for an employer’s favor. Now that the wars are over, the main thing people seem able to survive is themselves, and that’s the scariest thing of all. If only your work didn’t so closely resemble love, Camila—but that promiscuity infiltrates you like a disease. You wanted to live off your talent, and now it’s grinding you up in its gears. Photographs of an earth without a heaven; however much you talk about the need to be detached and ironic, I can’t help seeing a dense haze of ice blurring the lines of your flawless images. You put into your photography a discipline you never find in life; as people hurt you by omission, you shut yourself in your darkroom to fiddle with contrast levels. Though I endured periods of remarkable upheaval, the steady circumstance of love always remained unchanged at the center of my life. All my life I was as passionate about António as António was about your father, and the two of them loved me—love me—the same way I do, solidly, with mutual understanding. It’s hard for me to say “in my time,” the way people my age always do, because my time is simply that of sharing love with my loved ones. That’s why you, who arrived in my arms six years after my wedding day, are the same age in my heart as your father or his lover, who gave me the great fortune of knowing love. We endure the sharp blade of changeable moods and the slow persistence of interdependencies. You arrived at the right moment, Camila, because being in love closes us off from the world. And prison exacerbates the worst in us, even if we are unaware. At first their intimacy was hard on me. I spent whole nights with my ear pressed to the wall, hating their mingled voices, the conjoined rhythm of their bodies, the moans and slumber. I was so afraid of the startling things that happened in that room that I stopped sleeping altogether. I spent days and nights and nights and days in a trance, wandering through a house full of ghosts, singing lullabies about fairies and guardian angels, until I collapsed on the porch, dazed with sun and exhaustion. I would wake up the next morning with their hands stroking my hair, in the large four-poster bed where my mother was born. “Are you calmer now, silly?” António asked me, and I saw our three naked bodies aglow in the mirror on the dressing table, our legs chastely intertwined as in a children’s game. And for our entire lives we loved each other the way children do, never crossing over into eroticism, in a ruthless make-believe of pleasure and pain. All there is to know about love is astonished acceptance. A person can’t learn to love, Camila; no democratic endeavor can dole out passion in those pockets of poverty where it cannot reach, no factories can mass-produce it for assembly, construction, or export. There is nothing just about this emotion: indeed, justice is merely a performance of putting the world in order, a circus we created to replace the irrational law of the heart. Do not look for an explanation of my life, and do not view it with sorrow or shock; when I reach my doddering old age, read in these journals that I was happy. Do not worry about how or to what extent, and do not succumb to the temptation to distinguish between love and passion: little by little, I have come to see that those distinctions are traps set so that the wool will fall over our eyes and immortality will elude our grasp. Love, Camila, consists of the divine grace of bringing time to a standstill. And that’s all there is to say about it. From In Your Hands. Used with permission of AmazonCrossing. Copyright © 2018 by Inês Pedrosa. How Do We Move Beyond Commodified Feminism?